Ten years ago, “The Lord of the Rings” still sounded too “classical” to me. I had my Narnia. Why add another fantasy world? Then, before reading the books or seeing the film, I heard Howard Shore’s film score. And I was drawn into Middle-earth. With all the J.R.R. Tolkien fandom recently renewed, I wish I could say it was the professor’s written creation of Middle-earth that first drew me in. If I were a better man, I could say that I was given The Hobbit and/or The Lord of the Rings as a child, or else found the books at a library, or perhaps stumbled upon a copy in a dusty attic. I can’t even credit Peter Jackson, director of the original three The Lord of the Rings films and now the forthcoming The Hobbit two-part, for introducing me to Middle-earth. Rather, Rings film soundtrack composer Howard Shore receives that credit. Plus a guy named Daniel, in college. That was in fall 2001, mere months before the first of the films released on Dec. 19, 2001. With him, and my brother Dave, I saw the first film, on Jan. 5, 2002. First, I wish to stress that I did read the first book before seeing the film. My brother, alas! finished Fellowship literally as we pulled into the theater parking lot. So why my “alas”? Well, fans know: the Fellowship film’s ending has a significant plot development that was only included in The Two Towers book! So, yes, the d____ of B______ took him just a bit by surprise. Also, it so happens that this date, Jan. 5, was exactly ten years ago, from this column’s release date. Needless to say, I’ve gotten caught up on my fandom, and can recite dates and places, critique people who call the books a “trilogy,” and speak minimal Elvish like the rest of them (at least, enough Elvish not to starve or miss the restrooms if ever my plane was detained in their fair country). In fact, I share a birthday with Aragorn (March 1) and my wife and I happened to first meet on Frodo’s and Bilbo’s birthday (Sept. 22). Still, I started late in my Middle-earth questings. And now, ten years after seeing the first LotR film, I’m trying to remember how come I waited so long. I grew up homeschooled, but not in the kind of homeschool culture that either dislikes all fantasy or, perhaps worse, simply sees no use for it. Thus I became a Narnia fan fairly early, at age 10. Maybe it was the “these are sort-of secret Christian books” concept (partially true!) that allowed C.S. Lewis entrance. But as for his colleague, Tolkien? I’d never heard of him, Middle-earth, or brave Hobbits and an evil volcano of destruction. One memory comes to mind. I was visiting the house of homeschooling friends. Like most homeschoolers, they had shelves full of books. 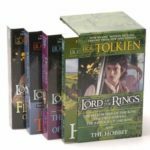 Three of them were The Lord of the Rings paperbacks. On the first’s cover, I believe, was a picture of a long-bearded wizard and a little man. They seemed to be in a cave (Bilbo’s house, I’m sure), and in the dark. Ah. Must be set at the center of the earth, with weirdness and dark tunnels. Sounds dull. And despite my friends’ lauding of this series, I paid it no attention for years after. My next memory of Middle-earth mentions comes from summer 2001, when I saw, in the Parade magazine with a Sunday newspaper, a brief paragraph about how ambitious the films would be. Some director in New Zealand was making them, all three of them, at once. Financers were pouring their money, and artists their hearts, into the project. Then I never heard about the films until later that year. Daniel, from the same college as I (though not in the same classes or direction), was a huge fan. Yet a friend’s enthusiasm hadn’t sold me before, and this one’s excitement only partially aroused my interest. It still sounded too “classical” to me, even if I now knew the story was not all underground in the literal middle of our Earth. I had my Narnia. Why add another fantasy world? Now I’m not sure what happened. I didn’t get ahold of the books. At this point, I don’t think I had even seen the first film’s teaser. But somehow, I did wind up on the internet — a groundbreaking new kind, called “high speed,” available only at school — and at a site called FilmTracks. I’d hung out there because I had just gotten into film scores, such as The Prince of Egypt music, and a few others. The Fellowship of the Ring score was here also (and believe it or not, this is very nearly the exact same page, with few text updates and almost no changes to the web design itself). Clips were available, in a primitive and strange format that you old-timers may remember as “RealAudio.” I listened. That clip, “The Prophecy,” is no longer listed there. It was from the first score release, and for a prologue that isn’t even in the film. Yet I listened. Only thirty seconds. I’m not sure how else to explain it, even after I’ve since heard that track, and the complete score by Howard Shore, multiple times. At first I almost didn’t like it. It was … classical. Dark, ancient, and mysterious. … Then it was transcendent. And magnificent. Soon I not only let my dislike fade. I loved this music. And the scent of it. Yes, that’s what I remember. A deep, rich, woodsy scent. Maybe it came from some opening into this majestic world. There in that college computer room, I first entered Middle-earth. How were you introduced to this world? 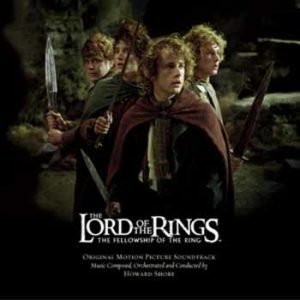 How did you first journey to Middle-earth, either by the original book series, films, or film soundtracks? I was just a kid when the movies were coming out. I remember seeing a teaser trailer on TV, hearing the name “Arwen”, and mistaking it for “Arawn”, the villain from “The Prydain Chronicles”, which my mother had just finished reading to us. (I am, by the way, also from a fantasy-reading homeschooling family.) I was so excited, thinking they were going to make TPC into a movie series. When I found out it was actually something else, I was disappointed. Before long, several of my friends suddenly began to be obsessed with this “Lord of the Rings” thing. At the time my siblings and I were really into Star Wars, and (because I’m ridiculously loyal to my favorites) I felt betrayed because one of my best SW buddies had “defected” to a different favorite movie. Now I firmly disliked LotR, because none of my friends were interested in playing jedi with me anymore. They kept trying to get me to play games about elves, orcs, and hobbits. I don’t remember where the turning point came, but eventually (around the time TTT came out in theaters, I think) I decided I wanted to know what all the fuss was about. My parents decreed that I should read all three books before I could see the movies. So I read all three books. And I watched the movies. And I loved them all. SW got left behind in the dust and I never looked back. 😀 I think I spent the better part of 5-6 years dangerously obsessed with all things Tolkien (and I have a legit Eowyn sword replica in my bedroom to prove it). At the time my siblings and I were really into Star Wars, and (because I’m ridiculously loyal to my favorites) I felt betrayed because one of my best SW buddies had “defected” to a different favorite movie. I think the Star Wars prequel trilogy and The Lord of the Rings trilogy had an intense competition for popular cult attention during those days! I think Star Wars was slightly more accessible to little children (not more appropriate — LotR’s not inappropriate, just more accessible). I remember having Phantom Menace sandals as a kid! Yes, Star Wars is less bloody and has fewer disturbing images, as a general rule. I was in 4th grade before my Dad let me read LotR. Then I read them, then I saw the movies. I was in art class. My art teacher taught sculpture as well as painting and drawing, and while I was working on a random painting, a guy in class was making a sculpture of Frodo and Sam. And every week, for the entire two hours, him and the teacher sat over there and debated the finer points of hobbits, the magic sword Sting, Mordor, the magic cloaks, and so on. This was long before there was even a hint of the movies. Naturally, my curiosity was aroused, so I went home and asked what Lord of the Rings was. My Dad turned out to be a huge fan from his college days, and we picked up the trilogy and the Hobbit at a used bookstore. It was kind of a slog, but once I got into it, it was fantastic. I even got the Silmarillion and read that, too, just for bragging rights. It makes LOTR so much richer. Later on, when the movies came out, I enjoyed them hugely. I know Peter Jackson made changes, but after the garglemesh that is the Harry Potter movies, I could accept a few changes to LOTR made for coherence. My story is similar to everyone else’s. My father was a Tolkien fan since he was in college, and he took me to see The Fellowship of the Ring when it was in theaters. I was either ten or eleven; I don’t remember whether we went to see it before or after my birthday. I liked the movie, of course, even though I know that I didn’t really get it. My father ordered taped recordings, and together we listened to the entirely trilogy read by a narrator. I had read/listened to all three books by the time The Two Towers hit the cinema. Eventually, I read The Silmarillion, and I think it was only after reading The Silmarillion that I read The Hobbit — probably an unusual order in which to encounter Tolkien’s world. But I think the thing that first captivated me fully were those wonderful maps on the inside pages of my father’s old, beat-up paperbacks! The back of the big three-in-one paperback edition of The Lord of the Rings that my parents gave me at one point has a quote from C.S. Lewis. 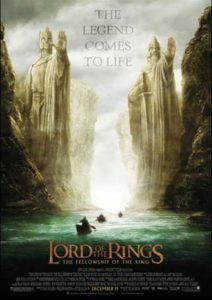 Recently, I searched the Internet for the review in which the quote appeared, and I found that Lewis wrote, “Our own world, except at certain rare moments, hardly seems so heavy with its past.” That’s what I love about The Lord of the Rings. 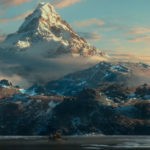 As a teenager, I’d wished dearly that Tolkien’s world could be real, because it seemed so much better, more heroic and special, than our own world and definitely than my own boring place in the modern world. 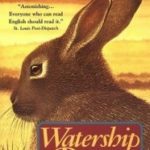 I had read The Hobbit a few times around 12 or so, but as a self-taught fantasy fan, I had no one to show me the way to other works. When we read it for English 9, I decided to go and read the Lord of the Rings, since I finished reading it early. It was a bit hard to follow at first, but after watching the movies, it made sense. The Silmarillion took two or three more readings, but I love it now, and even own three History of Middle-Earth books, The Children of Hurin, The Tolkien Reader, LotR and The Hobbit. All this encourages me a lot, for this reason: somehow I thought I was the only one who found it difficult to get into The Lord of the Rings and Tolkien’s legendarium. That still gives me no excuse for starting so late, and even then needing to acclimate! I am now going to reveal my extreme geezerhood by telling you that I first read the Hobbit before any of these works had been adapted for any type of screen. That means I must have been about 10. No more than 11, because that’s when the Hobbit cartoon first appeared on TV. Kristen, I can probably top your geezerhood. 😉 I read The Hobbit first. Tolkien’s work was all the rage at my college — possibly for several years. I resisted. I didn’t like getting on bandwagons. But somehow, probably the year after I graduated, when I had more time, I succumbed to the influence of a friend and picked up The Hobbit. I have to admit, I started it three times before I got hooked. I thought it was a bit long-winded, and I didn’t really care about Bilbo or Hobbits in general … until suddenly I did. I fell madly in love with fantasy at that point and snatched up The Lord of the Rings. But I was so disappointed when I realized Bilbo wasn’t going to be the star. Until I became helplessly hooked into Frodo’s life. After the movies came out, I began re-reading the books. They are so different from the style of writing today and that surprised me. I was soon into the stories all over again and forgetting the writing, however. I re-read The Hobbit too and was surprised that it didn’t see as rich as I’d remembered it. Stephen, I see what you mean about this piece of music. Interesting that it was music that introduced you to fantasy. I personally love, love, love the trilogy theme music. Wow, that’s a piece that gets into my soul and expresses love and longing and hope and courage like few other pieces of music do. Oh, let’s see…. Senior year of high school, some of the guys in drama class were excited about it (all younger than me), and promptly told me about the series. I decided to try the book before the movie came out, and read Fellowship literally right before seeing the movie in theaters (I saw the movies in college). A friend told me the five-minute version of the Hobbit. Then I finished reading the trilogy and saw the rest of the movies. I’ve read the books three times – all by the time the last movie came out. A friend in college had me watch the old LOTR cartoon movie and the cartoon The Hobbit. I was first introduced to The Hobbit when I was probably 10 or 11. I don’t remember much of it save that it had a two page spread of Bilbo and the Mirkwood spiders. That freaked me out and I turned that page faster than any other. I do not like seeing spiders. I didn’t mind reading about them though. Especially since they got beat. I probably read LOTR 2-3 times in those few weeks we had the books. Then my brother found out they were making a movie of it. Having seen too many good books ruined by not so good movies, I was not impressed. Until I saw the trailer. Then I got excited. 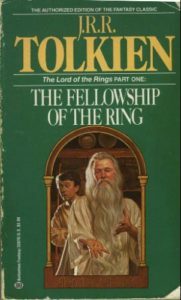 I read LOTR more times than I care to count before the FTR movie came out, and started reading it aloud to one of my younger brothers. After seeing the movie, I was obsessed. I discovered the Silmarillion and devoured it in a day. I followed every tidbit of news about the movies, memorized all the Elvish I could get my hands on, found the drafts and started reading through them, read Unfinished Tales and every other Tolkien book I could get my hands on. I utilized the glossaries and indices and made up Elvish names for myself and my friends. It was all a bit excessive looking back on it. These days, I regularly re-read LOTR and re-watch the movies (extended versions of course). The Return of the King soundtrack was my best study music through my final years of college and remains just about my favorite ever. All three soundtracks (extended and normal) are regular listening fare. I’ve read LOTR aloud twice two different sets of younger siblings and have every intention of reading them to my as of yet nonexistant children. I, like many others, was introduced to LotR by my father, who gave me The Hobbit when I was around 9 or 10. I devoured that and LotR shortly after. It wasn’t until I saw the trailer for LWW and was swept away by Harry Gregson-William’s amazing music therein that I hunted down the books and finally read them. Of course, I fell in love right away. Kristen, I can probably top your geezerhood. Hmm, Becky, perhaps a portmanteau? I personally love, love, love the trilogy theme music. Wow, that’s a piece that gets into my soul and expresses love and longing and hope and courage like few other pieces of music do. Shore’s soundtrack is the best and most magnificent music ever created by a mortal man. I’ve not seen — heard, really — its equal. Even the “regular” and first soundtrack releases were incredible, but to experience it all, one must listen to the complete recordings, which contain every piece of music composed for the films, plus more. A related question: does Shore’s score glorify God? I believe it does, in a common-grace way, at least! And yet … I love this “secular” music, for its majesty, more than hymns. I hope that is okay. Yet for ten years, this music, like the stories, has echoed God to me. I was logging in for a forum early in my obssession; I wanted a LotR name, so I flipped through the list of names in the Simarillion and the rest…. Same story: my father got me hooked on the Hobbit. Then I read the Lord of the Rings. Then I read the Silmarillion. And all this before I was 15 :). My English teacher in high school admitted to me she couldn’t even finish FotR because she found it boring lol. I read the Hobbit first, when I was six, I believe. Maybe it was early in my seventh year. Near the end of that year, my mom told me that Fellowship, TT, and RK were the sequels, so I read Fellowship. I loved it, but I didn’t tell my mom very much about the story, because I was certain that she would decide the Ringwraiths were too scary for me and tell me I couldn’t read them anymore. I recieved Two Towers and Return of the King for Christmas that year (I had turned 8 by that point), and read them over Christmas break. I can’t remember if I re-read them again right then, but I read them for my summer reading the summer before my eight grade, and that was when I saw then movies and became obessed with LOTR for the next three years (as all of my friends can attest to). Stephen, I agree; the soundtrack is quite possibly one of the most beautiful pieces of music composition that I’ve ever heard.